Planting some peas and onion sets. Sure, just let me finish tilling up the garden. "Can I make the row?" Sure, make it right over here by the fence. "How long should I make it?" Make it the whole length of the garden. "How far apart should I plant the seeds, Dad?" About an inch or so. "Like this? Now what do we?" Now we cover them over and tamp them down. "When do we plant the geraniums and tomatoes, Dad?" In another month or so when it's warmer. "Can I have my own garden?" Sure, you kids can each have a space to plant. "Mom, do you have a spoon?" "To dig with and plant geraniums." Okay, but bring it back when you're finished. "Dad, how do you get your tomatoes to grow so big?" ... And that's how kids learn to garden. My tomato plants have never been as big as those I remember my Dad growing. Maybe I was smaller? Maybe Dad had a secret, and didn't have a chance to tell me what it was? It's been 25 years, an entire lifetime since my Dad planted a garden. That last spring, he planted the peas and onion sets and then died before it was time to plant his geraniums and tomatoes. I planted my first garden in my first yard that same spring. I was shocked at how small my tomato plants were compared to his. I don't think I've ever gotten my tomato plants to grow as large as I imagine his tomato plants grew. It's okay, I'll keep trying, and maybe this will be the year I'll have bigger, earlier tomatoes, like Dad used to grow. Goodness knows, if I take advantage of this early spring, the way he would have, I might. I'll plant a pot of red geraniums, too, just like Dad used to grow, to remind me how I really learned to garden, how I learned to love to garden, all those years ago. What a wonderful tribute to your Dad Carol. I think he also planted love. Thats such a wonderful post... It reminds me of the herb garden I assisted my mom to grow. Even now, each year when I garden herbs are the first things I sow and transplant. What a lovely post. I don't recall any of my veggies or flowers being as big or lush as my parent's were either....funny thing huh? 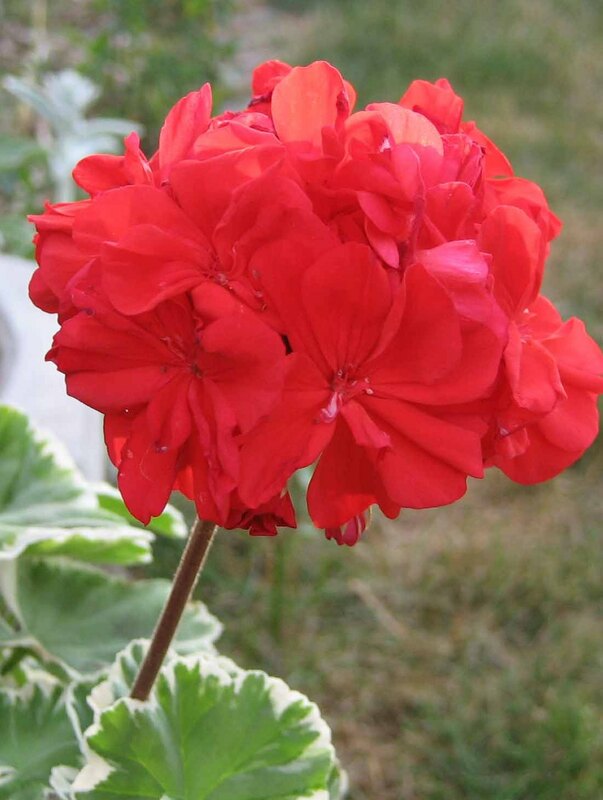 Lovely, My mother grew red geraniums in a permanent planter outside her kitchen and dining room windows, and my dad continued after she passed away. Now, he's gone and I continue to plant them in a pot. What great memories your dad planted along with those veggies & geraniums. That is a very good way to learn to garden. I need to plant with my granddaughter. She loves to garden. What a heart warming story and special tribute to your dad. I plant foxgloves in my garden for my dad. Isn't it funny how we associate a plant(s) with the people in our lives. I am sure your father is looking down and smiling and so proud of his legacy! xxo! This story about you and your dad moved me to tears, Carol, of a bittersweet sort. You were so lucky to have him show you about gardening, and he lucky for your interest. You are doing him proud with your own garden now. He would love your blog, too. A lovely post which reminded me of how much I learnt about gardenning from my mum and how she learnt form her parents. Think my children learnt a little from me too. he most difficult thing is to find a blog with unique and fresh content but your blog is different. Keep it like this.